Martin the Mammoth is back in action in My First Stone Age � The Card Game! Following in the footsteps of the 2016 Kinderspiel des Jahres winner, the game allows you to return to the Stone Age and join Martin and Guff the wolfhound on a quest to build a primitive village. This time, you�ll need to use all your memory skills to move Martin to the right cards and uncover the goods you need to build huts. During the game, you take turns moving Martin along a path of cards and revealing the goods card you find there. If you can keep track of which goods are where, you can snag the ones they need the next time around. 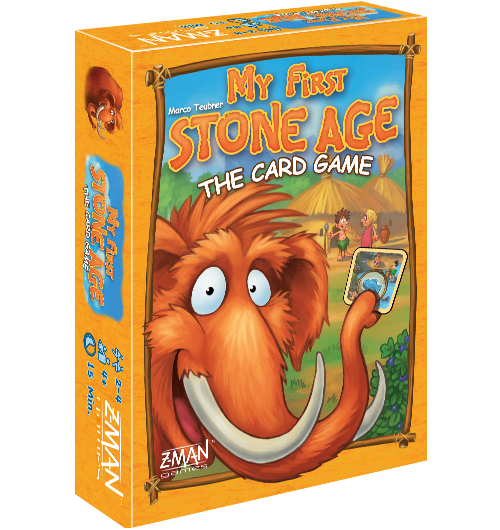 Let My First Stone Age � The Card Game spark your imagination and travel back to the dawn of history with the whole family! The excitement of My First Stone Age � The Card Game doesn�t end with the game itself. The game is also playable as an expansion for My First Stone Age, giving players even more ways to explore with Martin and Guff�s friends, the Stone Age children Jono and Jada. Now players can cut across My First Stone Age�s board with Martin or gather goods from the construction site. Each option can be useful, but you�ll still need to find the forest token that�ll take you to your chosen destination. No matter what, whoever can build their huts the fastest wins the game!